Home » Reviews » Book reviews » Dinosaurs: The Most Complete, Up-to-Date Encyclopedia for Dinosaur Lovers of All Ages. 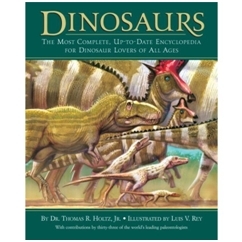 Dinosaurs: The Most Complete, Up-to-Date Encyclopedia for Dinosaur Lovers of All Ages. By Dr. Thomas Holtz, Jr. Illustrated by Luis V. Rey. Publication date 2007. 427 pg. Random House. ISBN: 978-0-375-82419-7. Author: Dr. Holtz, self-proclaimed “King of the Dino Geeks,” or as I like to call him Dr. Tyrannosaur, is a well-known and respected paleontologist who’s understanding of all things tyrannosaur is unparalled. As a senior lecturer at the University of Maryland and the Faculty Director of the Science & Global Change Program for the College Park Scholars, he has extensive teaching experience. I have had the pleasure of attending several of his talks at meetings of the Society for Vertebrate Paleontology and he has always been informative and interesting and his students have always been very positive about him. Illustrator: Luis Rey is an accomplished and respected artist, known especially for his paleo art. He has won the Society of Vertebrate Paleontology Lazendorf Award, given to outstanding artists and his artwork can be seen in several museums, books, and other outlets. He is known for very colorful dinosaurs with close attention to anatomical detail. He makes huge efforts to bring dinosaurs to life as actual, living creatures with as much accuracy as possible. A few have criticized his artwork for being too fanciful, in that he draws wattles and other structures on dinosaurs for which we have no hard evidence. But these structures are extremely difficult to preserve in fossils and their living relatives do have them. Matt Wedel, a noted dinosaur researcher in his own right (although he studies sauropods, not theropods like Dr. Holtz) has said, “If you go bold, you won’t be right; whatever you dream up is not going to be the same as whatever outlandish structure the animal actually had. On the other hand, if you don’t go bold, you’ll still be wrong, and now you’ll be boring, too.” Luis Rey has never been called boring. I decided to start off my reviews with this book, even though it has been out since 2007, because I think every school should have it. There are good reasons it won “Outstanding Science Trade Books for Students K to 12: 2008 by the National Science Teachers Association. It is called an encyclopedia and it does have chapters describing all the various dinosaur groups, but it is so much more. It is not a small book and here is my only real criticism of the book. Despite its title, it is not quite a book for all ages (School Library Journal rated it Grade 5 and up and it would take an exceptional 5th grader to read it). If you are looking for a book to read to little kids, look somewhere else. It is called an encyclopedia for a reason. Nevertheless, with that caveat in mind, if you are looking for a book to give your dinosaur-obsessed kid who can read well, this book is for you. It is not just for kids though. Adult dinosaur enthusiasts will like it too. What I like best about this book is that it does not simply focus on the dinosaurs. There are plenty of books that will give you an A-Z description of dinosaurs. Holtz gives the reader a feel for what paleontology is and how it works. The goal of this book is to explain why we think what we do about them, how we know what we know. He starts off the book discussing how science, particularly as it applies to paleontology. He then has a chapter on the field’s history, followed by three chapters of geology and geologic time to put everything into perspective. Chapters 5-9 discuss how paleontologists find fossils and attempt to reconstruct what they looked like and how they are related to each other. It is not until chapter 10 that he even starts talking about dinosaurs themselves and that chapter simply explains how they are related to other vertebrates. Chapters 11-35 are the meat of the book that everyone would expect. This is where he discusses the amazing diversity of dinosaurs. The last five chapters discuss dinosaur behavior and metabolism and how we approach topics like this that are not so easy to see in the fossils. The last three chapters then put the dinosaurs in context of time and ecology. Contrary to popular opinion, dinosaurs did not all live at the same time. They spanned a vast length of time and these chapters give the reader some sense of what the earth was like during the major time periods, who lived when and what other animals they lived with. The last chapter ends predictably with a discussion of extinction, but rather than just say the asteroid killed them all off, Holtz discusses some of the complications of that hypothesis, finishing off with how life continued after the asteroid impact (including the dinosaurs, who were only mostly dead, not completely dead, a few made it through and thrived as birds). At the end of the book is a series of tables listing all the dinosaurs, including where and when they lived and their estimated size and weight. Holtz doesn’t go it alone either. Scattered throughout the chapters are inserts from other researchers (such as Dr. Kristi Curry Rogers shown here) explaining various topics related to their own research, so the reader gets the perspective of many paleontologists, not just the author’s. A serious bonus for this book is that Dr. Holtz has attempted to keep the book as current as possible by posting online corrections necessitated by new research, which you can find here. As a final word, the book is superbly illustrated with numerous drawings, both in monotone and vivid color, by Luis Rey. There are no images of actual fossils, which some have criticized the book for, but my personal feeling is that the book was not designed to be a textbook for dinosaurs. It was designed to show the dinosaurs as living animals, not simply as their bones. There are plenty of other places one can find that. This book is for a view of what they were like alive and most importantly, why we think they were like that shown here and how we study them. For other reviews of this book, try here, here, here, and here, among others. All illustrations above can be found within the book, as well as the linked sites for Luis Rey and Dr. Rogers. By paleoaerie in Book reviews, Reviews on August 19, 2013 . This is my 1st time commenting on Paleoaerie & I like what I’ve read so far. 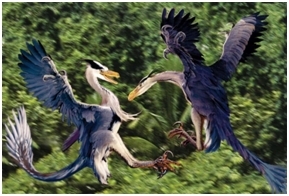 I’m surprised you made that criticism, given that you provided a link to Taylor’s review (Quoting Taylor: “It has something for everyone: the youngest child can enjoy Luis Rey’s distinctive, dynamic illustrations; slightly older children will appreciate the descriptions of individual dinosaurs; those older still will be able to understand chapters on the history of dinosaurs, the fossilisation process, geological time and more. And even most adults will learn something from the chapter on cladistics — surely a first in a book aimed primarily at children”). Otherwise, good review. Thank your for reading and for commenting! I don’t really view it as a criticism, although I can see how it might be taken that way. I appreciate Taylor’s opinion, although I think our difference may be in our view of the audience. If one assumes that the audience is a parent who is actively reading the book with their toddler on their lap, then he is quite right. So long as the parent is holding the book and reading, a small child can enjoy the wonderful illustrations and get something from it. However, if one is viewing the audience as an elementary school teacher who is planning on putting the book on the shelf for K-2nd graders to look at on their own, the book would be inappropriate. It is too big, the reading level is above the kids’ abilities, and would get torn up and destroyed in record time. For practically any other use, the book is fantastic. Now I see what you mean. Could be worse though. I’m in the process of reviewing what’s probably the most obnoxiously big (bigger than my torso) popular dino book ever. It’s as if they didn’t think the content was bad enough & wanted to add insult to injury (more like injury to insult, given that a kid would probably get crushed under the book’s weight). 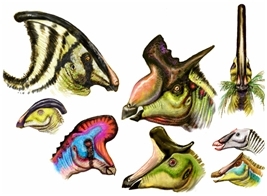 BTW, would you agree that Holtz’s “Dinosaurs” is the best encyclopedic dino book for casual readers ( http://whenpigsfly-returns.blogspot.com/2008/04/paleo-reading-list.html )? I ask b/c, if so, I recommend reviewing the best non-encyclopedic dino book for casual readers (which, quite coincidentally, came out around the same time): The 2006 edition of Gardom/Milner’s “The Natural History Museum Book of Dinosaurs” ( http://www.amazon.com/Natural-History-Museum-Book-Dinosaurs/dp/184442183X/ref=sr_1_4?s=books&ie=UTF8&qid=1358375235&sr=1-4 ). AFAIK, there are very few US reviews of it, expert or otherwise. I’m guessing that’s partly b/c it’s a non-US book (It’s always 1 of the Top 100 dino books at Amazon UK). I’ve tried bringing more attention to its greatness (See the above Amazon link for my review), but I’m just a non-expert dino fan. I agree with you about Holtz’s “Dinosaurs.” It is easily one of the best out there. The London Natural History Museum has put out some quality dinosaur books. I vaguely recall the book you mention, although I don’t remember much about it as it has been a long time. I will have to get a copy of it. Thanks for the recommendation! I’m looking forward to reading the review you are working on. Anytime. Looking forward to your future review of it. I’m especially curious whether you think my Amazon review accurately describes it (E.g. “A more family-friendly version of Sampson’s Dinosaur Odyssey: Fossil Threads in the Web of Life”). I’m guessing you know which book I was referring to. I’ll let you know when I submit my future review of it. It’s been a long time coming & I can’t wait to officially tear it a new 1. 1 more question: Is it safe to say that, next to the London NHM, the AMNH has published more/better popular dino books & organized more/better dino exhibitions than any other dino museum? I think so, but want to make sure. That’s a good question. I can’t say for sure, but I think you are right. There are many others who have put out a lot, but few who can seriously match the AMNH in both quality and quantity. 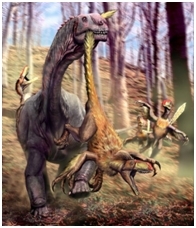 1stly, I finally submitted my review of Brusatte/Benton’s “Dinosaurs” ( http://www.amazon.com/review/R3J1R5BYAZABGZ/ref=cm_cr_dp_title?ie=UTF8&ASIN=B009S8HJRM&nodeID=283155&store=books ). I hope you like it. 2ndly, this reminds me of something I’ve been meaning to ask: I was wondering if I could get your help w/something dino-related. If so, should I leave it here in a new comment or would you rather me email it to you? Many thanks in advance. Interesting review. Perhaps a bit harsh, but I agree with you. I also thought the book was unnecessarily hyperbolic and questionable in parts, and I disliked the art in many instances. For a book that relies primarily on its art as the main selling point, this is a major flaw. Csotonyi, on the other hand, has created some great paleo-art. He’s a really nice guy, too. If one looks closely at the Paleoaerie label, you will see most of the letters are pieces of his artwork which he has kindly allowed me to use. Thanks, Julius! I have been thinking about doing a review of that book, but now I can simply refer people to yours. There are better books out there if one is looking for a coffee table dinosaur book, which this book kind of reminds me of (dangling participle, I know, but the “proper” way sounds terribly stilted). You can email me directly at paleoaerie@gmail.org. I’ve been having a great time working with a local museum on an upcoming dinosaur exhibit and a National Fossil Day event. I would be happy to help if I can. I am not much of an artist, though, so I can’t help in that regards. Just did. Many thanks again. Hope to hear from you soon. I re-sent my email earlier today & wanted to make sure you got it this time. Many thanks again. This blog does not cost me much in the way of money, but a great deal in terms of time. As long as you have a computer and an internet connection, there are several places that you can set up a free blog. WordPress.com. Blogger, Weebly, and several others will host free blogs and they almost all have easy templates to follow so no coding knowledge is required. However, if you want more bells and whistles, more space, and more services than are available on the free versions, they all have paid accounts that allow for more. The costs can be minimal up to very expensive websites that really require professional care. But for a basic, no frills website, they can be gotten for free with a fair bit of time.